I rooted my Sprint Galaxy Tab and followed the instructions to delete the SprintAndroidExtension.apk file from the /system/apps directory. I stored a copy of it in a directory on the SD card, though. Anyway, it worked for a couple days and the nag was gone, but today it is back. I'm not sure how either. I checked and the file is not back, but the nag is. Thanks for the post. That's interesting and I have not ran into that problem. I have discovered another workaround to disable the nag screen. If you enable airplane mode the nag screen will not appear. The downside to this is you have to remember to turn on wifi after you reboot or cold boot the Tab. Thanks for visiting! Followed your instructions on both the rooting and getting rid of the 'nag' screen. Everything went very well. The instructions were so easy to understand that I was wondering if you could point me to some instructions to make my Sprint tab a Verizon tab. I would like to activate my Tab with PagePlus. 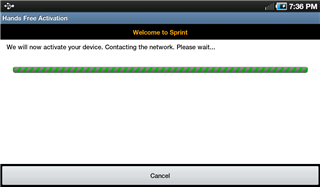 wlafaver said... "make my Sprint tab a Verizon tab." First, thanks for visiting my blog. I'm sorry, I don't know what would be involved in switching carriers. I imagine Google is going to be your friend in getting that resolved. You might try calling Verizon. You could get lucky and find someone willing to help. Good luck! I'm not sure what to do at this point, any help would be amazing! Yayyyy!!! I can see where you have to be careful, but it worked like a charm. Thank goodness there was a way to remove it w/o having to flash the rom. Thanks for the post.